I have written an essay about the book I am translating, focusing on the hidden indignities of the female characters' lives and how they can appear like precursors to the stories we're hearing in this new #MeToo era. Mariateresa Di Lascia finished writing her magnum opus, Passaggio in ombra, 25 years ago this year -- meaning she could have no notion of #MeToo. Indeed, as I mention in my essay, she wrote the novel "long before the words “me too” meant anything other than “ditto.” But I see the book as incredibly pertinent to the way our society is finally grappling with how a woman’s life is often marked by an endless series of hidden indignities that mar and distort. While the prose may at times have an antiquated bent, the crushing double standards dished out to the novel’s heroines are disturbingly familiar." I use the character of Giuppina as one of the more salient examples; she is raped and forced to give up her child. "Who rapes her?" I wrote. "A friend of her father’s. A friend. She’s a fictional character yet that description gives me the chills. This is a moment where the trauma women experience is finally coming to light. And this is a novel where the trauma women experience forms the backbone of the narrative." This little book published 25 years ago is seeded with little incidents such that all kinds of crimes against women are hidden in plain sight. As I mention in the Ploughshares piece, that tells me the value of exploring older books to see what they can tell us—to see what they have been telling us all along, whether we realized it or not. How long do we need to know something before the urge to act on this knowledge bursts upon us? I won't lie. It might be better to re-christen this rubric -- at least for this year -- the Year in Translating. That's because, on the writing front, in some ways, there's very little to report. Because of my teaching duties at UCONN and the translation projects I've begun, I published very little this year and most of my writing was devoted to book reviews and critical essays (including one for Literary Hub about an Italian woman writer finally winning the Strega literary prize after 15 years of male winners -- see link below). In other ways, there are some important milestones to report. *I won the 2018 PEN America Grant for the English Translation of Italian Literature. It was a thrill, and a heady recognition for anyone in the literary translation field. And also: that's $5,000 in the bank! Now I just need to publish this beautiful, little Italian novel (Passaggio in ombra by Mariateresa Di Lascia). *These translations included my first in-print translation courtesy of the Kenyon Review for a lovely little story by Francesca Scotti (see photo above). *Last but not least, I received my first personal rejection from The New Yorker for a short story I translated. 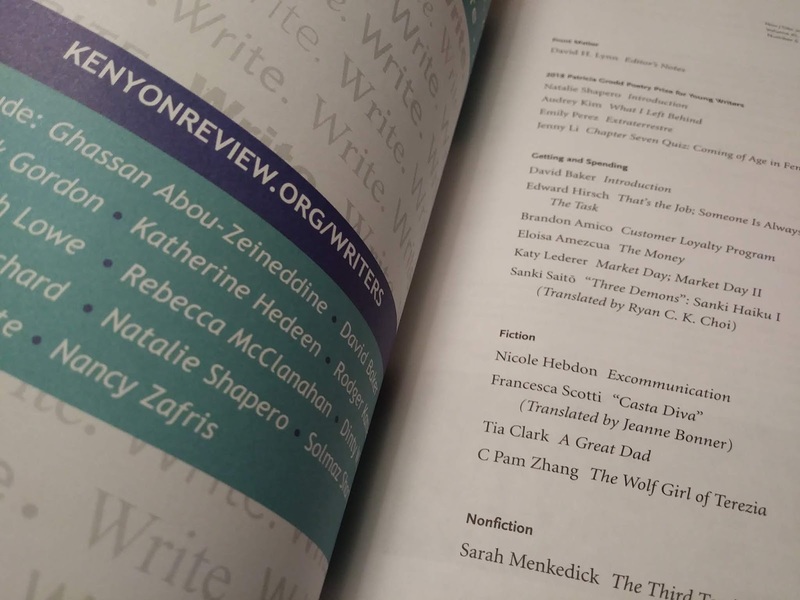 Yes, a personal rejection that included my name from a real person (the fiction editor!) and kind words about my submission! From The New Yorker! Yes, that New Yorker. I will admit I would have preferred to publish more writing, particularly of the non-critical variety (and receive a yes from The New Yorker on the translation). The time that I spent grading and preparing lessons -- ARGH! But as I continue my journey with writing, I see how long the road is but also how I can reconstruct my personal road map with new destinations and side routes that I believe will help me reach the final goal. What do I mean? I believe translating a novel is a very fine, self-run apprenticeship on how to write fiction or how to publish a book of nonfiction. (It's sounds slightly delusional, I know, so I was thrilled to read something to that effect in an essay in an anthology on translation edited by Lynne Sharon Schwartz -- my old Bennington prof -- called Crossing Borders). So the final destination for me remains writing a book. I've just taken a few detours. Will they ever see the light of day? Who knows? Right now, a dozen different iterations of them clutter my Dropbox. If you're interested in what's happening in the Italian book world, you can check out one small bit of writing I did this year by taking a look at this article, the one that I wrote for Lithub about the first woman Strega winner in 15 years (brava, Helena! For reference, the Strega is Italy's top book award). Here's to another year of writing and translation for me. I hope all of you will continue with your creative projects, too! Also: have you written your year in writing? Or translation? Or woodworking?! Short story translation -- in the Kenyon Review! I'm thrilled to say a short story I've translated has been published in the Kenyon Review! It's called "Casta Diva," and it was written by Francesca Scotti. Since it's not online, the best I can do is post a link to the table of contents of KR's latest print version. The Kenyon Review has invested steadily in literature in translation and published my review last year of a new translation of Natalia Ginzburg's Lessico Famigliare. For those keeping track, Scotti is the fourth Italian woman writer whose work I've translated and published this year. Year of the woman? I think I'll be at it more than that. Here's the final slice of the diary I kept during our first trip to Italy with Leo. Re-reading my notes, I see my journal was more of a hodge-podge of reminders and lists, with much less reflection on my complicated ties to the crazy boot nation known as Italy. But that's the nature of travel with children. 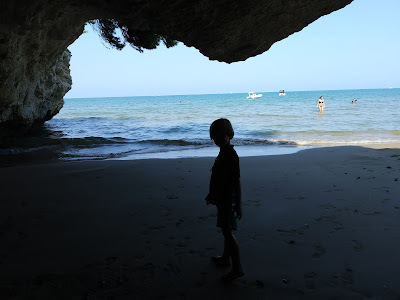 I needed to take Leo to Italy -- to marry the two parts of my life -- even if it left me little time to write while there. 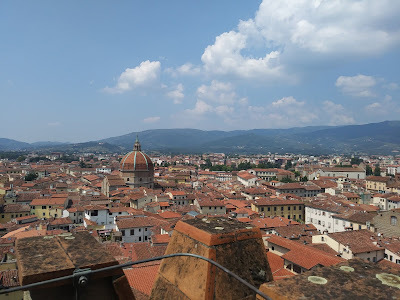 My apologies that the reading isn't particularly engrossing, but the trip, and the practice of recording my thoughts as I reunited with my old adopted country, reminded me of something I wrote in another Italian trip diary: I want to live in Italy and the US, or really Italy and somewhere else. Because everywhere is somewhere else compared to Italy. Thank you for reading! 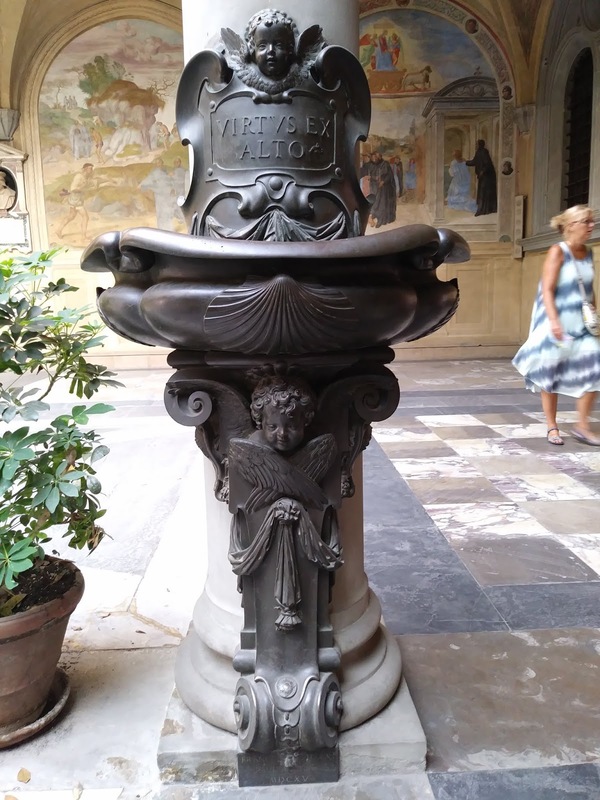 Scoperta #2, in piazza Santissima Annunziata – the rooftop cafe of the Museo degli Innocenti. Vista da mozzafiato. Breathtaking view of the city – the Duomo upclose, in the background the hills. Also a very elegant bar! Ritual visit to the Mercato di Sant’Ambrogio where I used to do my produce shopping when I lived in Florence. Leo and I made the rounds of the outdoor produce vendors then went inside to buy some gorgonzola, just as I used to do. I looked at the shoes on the far side of the market and then darted across the piazza to the mercatino antiquariato. 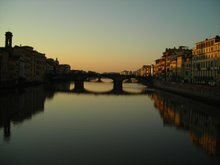 Antiquing in Florence? Don’t mind if I do. My life in Italy is lived often on foot. Eating and drinking often, and often outside the (my) home. Constantly collecting receipts from said eating and drinking. Lots of wanting, lots of consuming. Life in the USA: Probably less activity, but also less stimulation – in tutti sensi con lati positivi e negativi…in every way, with positive and negative connotations. Aug 3, 2018 -- STILL! On the highway between Rome and Naples, and we are surrounded by some of the highest mountains I’ve ever seen. Gorgeous. Let’s go climbing! Stopping at the autogrill on our way down south, we order sandwiches for lunch and the cashier automatically asks, “Il caffe lo vuole dopo?” Do you want a coffee after your meal? From the Department of business cards I saved: Our fresh fish diet in Puglia, courtesy of La Pescheria, Loc. 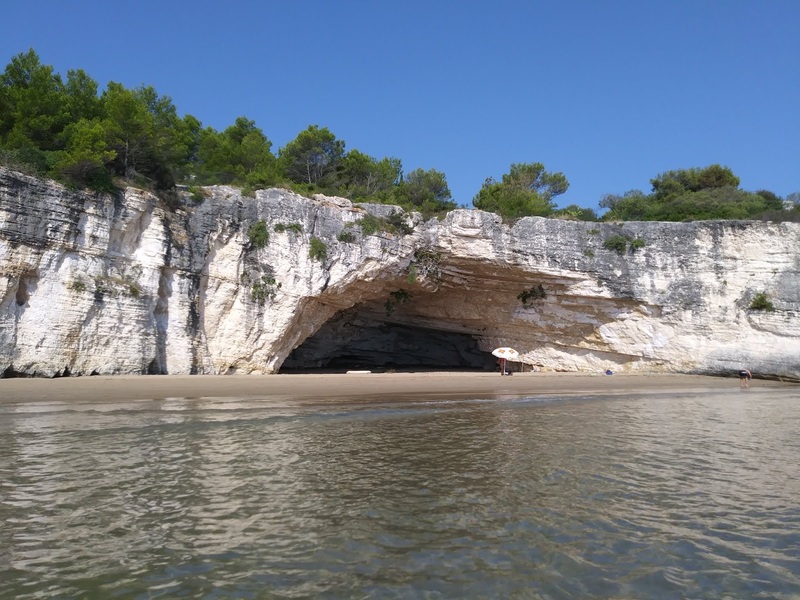 Defensola, 68, in Vieste. Where the fishmonger asked Leo, “Come ti chiami?” and he not only correctly replied, “Leo,” but also knew the answer to “Quanti anni hai?” (The response: Sei – 6). Another moment where a heart of attack of happiness nearly leveled me! *Walking – but sometimes careening -- down a rock-strewn path to reach our preferred beach in Vieste (Puglia), only to then walk across the tiny spit of a beach and through the water to reach a second even better beach. (Just like Jersey! Well, no, not at all). 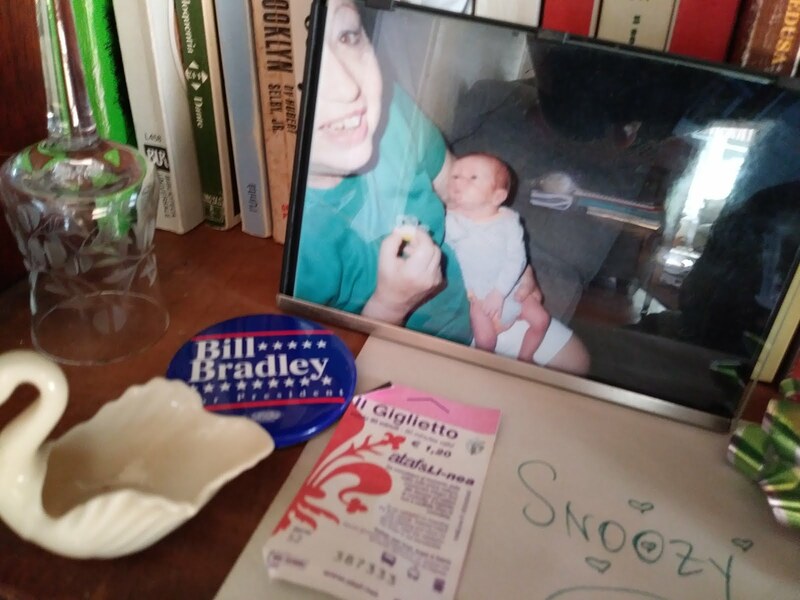 *Also Italians on vacation – an encyclopedia of habits in and of itself (i.e., the gear they pack – including proper lunches with real utensils and snacks, not handfuls of sandy potato chips – in order to stay at the beach ALL DAY. And I mean ALL DAY). *The light – the sunlight, especially at 5 pm. Artists, of course, have known this about Italy for centuries but it doesn’t lessen the "eureka moment" you might have every day here. Cristiano cannot host us in his apartment in Naples because a pipe burst so we call the B and B where we stayed the last time we were in San Marco and managgia, they are hosting a wedding party so the main hotel – the beautiful, stone, medieval building – is occupied but there is a satellite location we can stay at. First night in San Marco (Mike’s grandfather’s town) and it’s "summer fest." We arrive tired from the drive and from two weeks of full-on vacationing only to find our hotel (the satellite location) is two feet from a blaring musical block party of sorts that went on long into the night. Quiet mountain town? Not so much. I took melatonin, inserted ear plugs and drifted off to intermittent sleep. By music, I mean there was a live band (they played a version of Gianna Nannini’s "America," the only bright spot of the night) AND a DJ playing techno tunes. Yes: techno music hammering our little hotel where our little angel somehow managed to sleep (although only about 9 hours). Ahhh....Italy! How to rebuild “Marisa” in a way that lifts it above the traditional original stesura that is trite and lifeless? Note to self: Re-read Alice Munro short stories. Is this worth the time or what about “Polly’s Guide to Italian Men”? We are finally at a low moment in the trip – our stay in San Marco, two nights of ear-splitting music for the majority of the night. Not 2-3 hours, because they probably played from 10 pm to 3am or 4am (I declined to look at my watch for fear of flying into a rage). Best laid plans of mice and men. We had talked up the visit to the town so much to Leo (who christened it “Cocca-town” since half the population or more has "Cocca" as a surname). Well, I suppose really the visit was only disappointing to the adults so onward and upward. We are on the coast of Puglia, “immersi nel verde” (as hotel brochures like to say) but it’s a verde molto particolare. The Airbnb house isn’t in a forest ("verde") but rather a grove of olive trees, fig trees, palm trees, etc. We are staying in the town of Vieste in an area called Defensola. When we arrived, we were tired from the long journey, and we stopped at a gas station where there was also a restaurant. 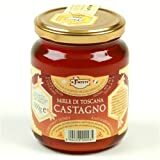 (Not so odd in a smaller town, especially a resort town like Vieste,) And it was there that I ate the best spaghetti alle vongole I’ve ever had (spaghetti with clam sauce, but it was a type of clam I’ve never had stateside – long and meaty). Stunningly good. Leo asks, “Mommy, what’s your favorite number to count to? (Editor’s note: these are actual questions, transcribed as close to the moment uttered as possible so as to ensure authenticity. I want wallpaper with these questions. I want these questions to never end. Oh and for the record: 100, Florence, sea turtle and 11). In Vieste, there’s no orario continuato. Shops – even the larger supermarkets – close for lunch. What a throwback. How this trip differs from the last two: full immersion vs partial immersion. Awake, alone, translating, scribbling notes nel bel mezzo della campagna pugliese. I’m surrounded by olive and fig trees, as I mentioned, and I feel like the only person alive. Yay! (I can hear, however, noises from birds and other animals lurking about plus the clink of the coffee spoons in the vacation rental next door). Vieste is the Italian summer holiday headquarters. We are just outside the town and in an area dominated by vacation villaggi – only Italians would dream this up. They’re not resorts – few stars/stele – but with the all-inclusive vibe (including presumably a coffee bar!). Everyone is squeezed in on top of each other – which is how they like it! Even in the digital age, Italians still hunger for human contact. Final morning of the trip. We’re in Focene, a seaside town outside of Rome by the airport. Note for future trips, Jeanne: the beach towns near the Rome airport! That’s where it’s at. As I write, I am eating the largest ciambellina I’ve ever seen (hot from the oven!). Perfetto! I've had another translation published -- and another Italian woman author can now begin building a following in America. Lori runs past me in the hallway. He says he has to use the bathroom. I follow him with my gaze then I look back at Max’s pained face. I keep my hand on the door knob. He’s not coming in anyway. He readjusts his eyeglasses on the bridge of his nose; it’s a new tic of his. He’s been doing it over and over now for a few months. When we were together, he didn’t do it, this tiny repetitive movement. It could drive you nuts. But maybe he just needs to tighten the screws on the frames. “How did it go?” I ask. “Is there something I need to know?” Is it about Sandra, I wonder? But I don’t say it. Once upon a time, I think, as I close the door. But it didn’t go that way. We're experiencing un caldo tremendo which I’m exacerbating by drinking too much wine and eating too much everything. I am actually ‘carb-loading’! Something I rarely do. Pizza/pasta/even taralli, which Mike bought and which I normally swear off. Plus lots of morning biscotti! (We bought a bag of galletti at the store). Dexter works now at the Scottish pub – in Corso dei Tintori. I learn this by leaving the apartment rental and bumping into him two blocks from Santo Spirito. He’s on his bike, biking to work. How long has it been since I’ve seen him? Not sure. Could be two years. Could be 10. Vicki says we can take the #2 bus to the Giardino all’Orticultura. Also the #57 bus. Children can turn any event into a time for play. We went out with Ilaria and Rosario tonight and afterwards when they took us to the train station, I think Leo simply liked waiting on the platform for the train. It’s also amazing how much can be communicated without words. Leo doesn’t speak but a few words of Italian but he definitely “met” Ilaria and Rosario. He knows them now. Writing? Almost nothing. Translating? Little, but I did buy a new copy of the Di Lascia text so I feel (mistakenly) like I’ve actually accomplished something (I’d kill for a version in hardback). I have to restrain myself in the bookstores. There’s a new one here in Florence – IBS. The Internet portal turned brick-and-mortar store. It’s enormous. On Via Cerretani. Angelo e Vicki's boys -- David (9) and Kristian (12) -- are learning English in school but they were shy about speaking it when we met up with them today! I love talking to them in Italian. I like the way they enunciate so clearly – I think all children do. It’s before the mumble stage that the rest of us carry on in. I pay a visit to Roberta, the scarf store I once patronized. But the viscido salesman from so long ago whom I’ve been trying to drop into a short story isn’t there anymore. On the train again, this time headed to Pistoia to see Giovanni and Veronica. It’s one of the appuntamenti that mean the most to me during our trip. Two nights in Giovanni’s mansardo. Quiet, peaceful, an outpost of generosity. 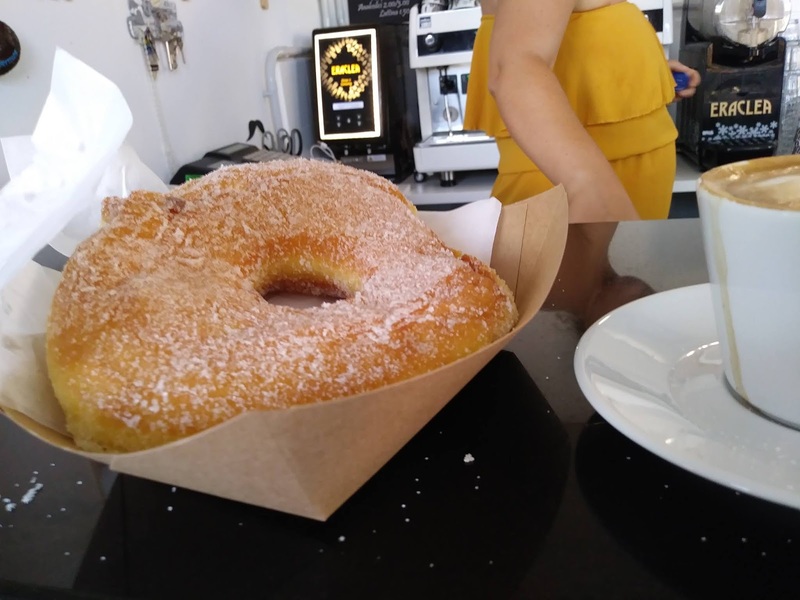 We wake up in the morning, there are three kinds of biscotti, coffee, hot milk, marmellata, homemade bread and a willingness to help in any way. Giovanni and Veronica are the best kind of Italians. Plus they have a veranda where you’ll find an olive tree, a lemon bush and two planters full of basil. An oasis, a house full of love and all of the mementos a loving life produces. (Back in Florence) Leo and I visit the private park at the Four Seasons hotel behind Irene's house. Irene said we should just tell the concierge that we are going to the cafe. When we walk up, there are two doormen out front and I dutifully tell them that we want to visit the bar (but not without some trepidation), and one of them looks at Leo’s shirt – a Fiorentina soccer jersey – and says, “Con quella maglietta lui può andare dove vuole!” With that shirt, he can go wherever he wants. The private park – or the hotel grounds, you could say, but they are large enough and grand enough that the word park seems to fit – is exquisite, with sculpture and perfectly manicured landscaping. But also confounding. This is Florence? So manicured, so pristine. An oasis tucked away that it would appear only rich foreigners can enjoy, while outside the walls of the hotel property a heat wave broils the city. Ode to the iconic Italian coffee bars: a refuge, un appoggio, a democratic venue, culinarily speaking. They are communal spaces where most people consume their coffees side by side at a counter, unlike at Starbucks where many retrieve their coffees and then retreat alone to a table. (Retrieve and retreat). Italian coffee bars are mini town squares -- in small Italian villages, they function practically like town hall where anyone and everyone comes at some point in the day. They open in the morning for coffee and pastries and often remain open until midnight, serving wine and beer and just about anything else you can think of. But mainly they serve company, they serve interaction and community. Chitchatting with the barista about soccer or politics is a time-honored Italian tradition (and one of the best reasons for an expat to master Italian). It’s the real bar “where everyone knows your name” (though unlike the bar in "Cheers," visits there often have nothing to do with alcohol, especially for Italian patrons). Still staying at my friend Irene’s house in Florence (my old roommate!). I’m having one of those moments that seem inverosimili. How did I get here? Oh sure, it’s not like I know the Queen of England but I know someone whose gorgeous apartment overlooks a private park attached to a hotel that's so grand the Queen of England might actually stay there. Unrelated: Would the Accademia della Crusca care to collaborate?! (As if) I’m driven to jotting down instances of English I see in Italy for airport parking. Specifically, it’s signage for an off-site parking lot – presumably open to all, including, ahem, Italians! – and it’s simply called PARKING. Like that’s some internationally-known word or brand, along with Coca-cola, OK and computer. Um, not really. (As I transcribe these notes, I see an article in ITALIAN trumpeting “foliage” tours near Torino. Because only in English do we have foliage. Leaves and especially leaves that have turned Fall colors are clearly NOT NATIVE to Italy (!!! ), hence they must use an English phrase to describe the phenomenon. Poveracci! No word, apparently, for foliage. Despite thousands of years of actual foliage). We arrived in Rome today and we’ve already visited the Pantheon, my favorite building in Italy (Mike's, too). I asked Leo if it was now his favorite building in Italy, too. Wisely, he held off on commenting, having only arrived two hours ago. Our hotel is tucked inside the walls of the city, by the Villa Borghese. A proposito: at the park around the Villa, our visit morphs into a one-of-a-kind, laugh-filled afternoon tooling around the sprawling property in a "rickshaw bike." It looks – vaguely – like a rickshaw but has bike wheels. And feels as though it is about to tip over every second! I am awake now at 3:30 a.m. Probably partly an oversight, as far as the sleep aids I chose, but also the Italian motor within has been awoken and won’t shut down! Walking + streetlife + errands + vistas + the lingua di Dante. That’s too potent a combination for a simple sleep aid to conquer. In Rome, seeing things I’ve never seen before, despite myriad visits and even a summer spent tutoring spoiled Roman noble children. Take, again, the Villa Borghese and the magnificent park that surrounds it, which includes an overlook in Piazza Bucarest of the city, bursting with cupolas of every size. Oh this exists? Oh, okay. Plus Via Veneto. I remember being there maybe once. How fancy! Home to the American Embassy, well whaddaya know. Even Palatine Hill – sure I’d visited before but so much of it appeared thoroughly new to my eye. Is that Rome's magic? In the taxi ride from the airport, I saw a sign for Via Merulana, from the Gadda book (The one with the title that begins "Quer pasticciaccio"). First time visitor! 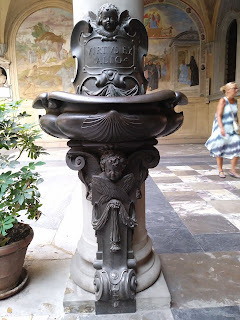 In Florence now: we are staying on Via del Campuccio, in Santo Spirito, a stone’s throw from my old apartment on Via dei Serragli. The key for the door: to open, place the logo down and turn clockwise a quarter turn. Va bene. I’ll try. Scoperta: Piazza Torquato Tasso has a playground. And a small soccer field. The piazza is also home to Il Tranvai (where Floriano took me many moons ago). 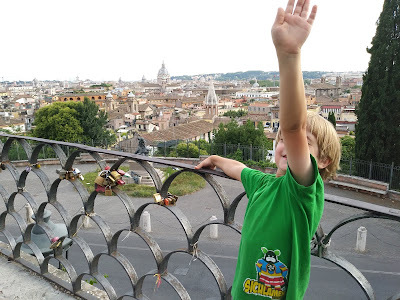 Leo and I walk onto the mini soccer field where we find a 6-year-old Florentine boy who’s more than happy to kick around the soccer ball (courtesy of the Della Roccas -- see below). 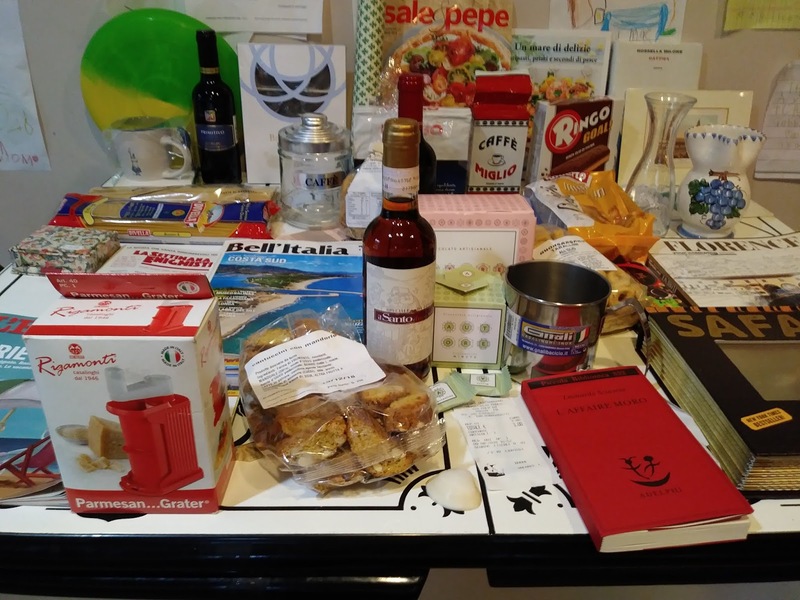 My favorite post-Italian trip ritual (outside of crying and lamenting my exile) is to lay out my souvenir haul on a table and arrange the items for a “group photo.” Yep, a group photo of my souvenirs. 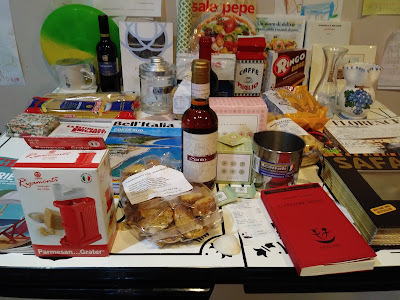 It’s essentially a tiny, secular shrine to all the things I love about Italy. Probably sounds sad! 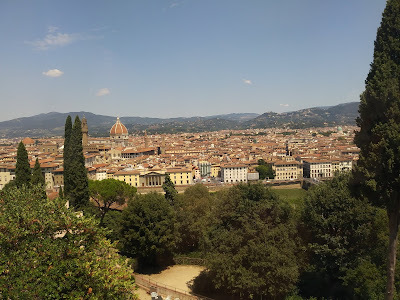 Odd thing is that in my post-trip melancholy, I find that seeing the little bits and pieces of Italy I’ve cobbled together to bring back gives me a tiny jolt. Right now, in particular, a steady bolt of vacation memory euphoria comes my way every time I catch sight of a small ceramic wine carafe decorated with an image of grapes that we bought in Vieste, in Puglia’s Gargano peninsula. Essentially my life depends in this moment on its beauty, on how lucky I feel that I persuaded Mike we could fit it into the suitcase. Also a set of "Buongiorno" coffee cups. The “O” at the end is actually a little picture of the sun! Dying over here right now from the Mediterranean madness for quaint and picturesque. And a beautiful picture of Florence – is it an engraving? Not sure how to describe it. And many many other things, including books, of course (Rossella Milone’s Cattiva AND a book of poetry Edith Bruck gave me as a gift and finally Sciascia’s book about the Aldo Moro kidnapping); magazines, the weekly puzzle magazine Italians are crazy for (not the only weekly puzzle book for sale at the giornalaio, if you can believe it! Not even close); a Florence coloring book of important paintings from the Uffizi (for Leo, though I can attest it will satisfy big colorers, too), plus two baby bottles of wine from Puglia (which is to say bottles of wine that are small, not baby bottles you might give to a baby) and a quartino wine carafe, like you get in a trattoria. Putting the two wine carafes aside, the items I prize most whenever I return from Italy are inevitably made of paper. The books, the magazines, the Florentine paper. I even bought a roll of paper with the Florentine giglio to line dresser drawers and kitchen shelves. And I am not even thinking of all the little receipts and business cards and brochures I tucked into my purse and which followed me home. As they did last year; the bag of receipts from Torino is still sitting in my closet. If I were to look at them, I would find -- like Hansel and Gretel’s bread crumbs -- a trail of the places I visited. So there you have it – my souvenir group photo. Holding onto the trip by gazing at my shrine. I swear I rarely have the privilege of saying "I won" but I can truly say I have won a grant to continue work on a translation of an important Italian book that I desperately want to bring to the English-speaking world. The award is the PEN Grant for the English Translation of Italian Literature, part of the prestigious PEN-Heim Translation Grant program (given by PEN America, which is probably the most important literary organization in the US, and one that is on the front lines, fighting for writers' freedom to express themselves without fear or repercussions all over the world). 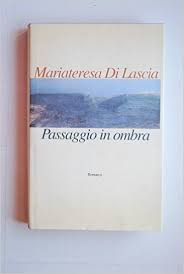 And the book is Mariateresa Di Lascia's 1995 novel, Passaggio in Ombra (working title: "A Walk in the Shadows"), which won Italy's top literary award, the Premio Strega. 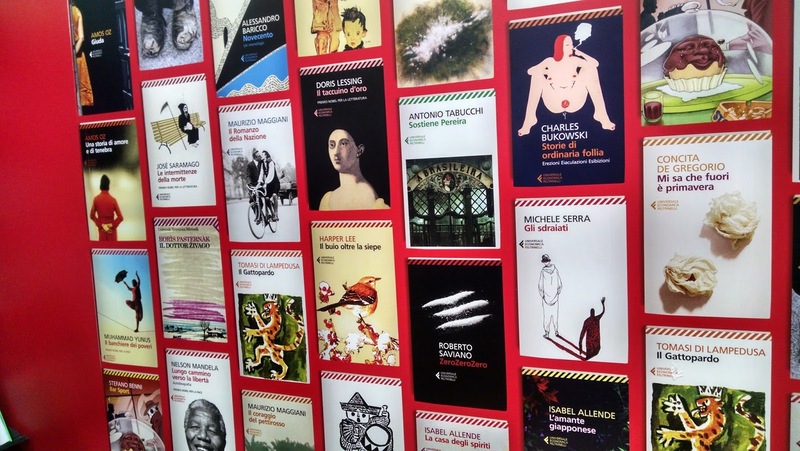 You can read about the other wonderful projects that won PEN translation grants here. 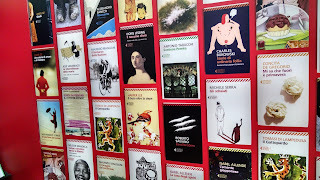 Long live Italian literature -- particularly literature by women authors!